Depending on whom you talk to, Views from the Avant-Garde, the New York Film Festival’s experimental outpost, has either stubbornly or bravely maintained its core of what could be called the “traditional” avant-garde: screenings devoted to the work of long-canonized elders, a familiar range of formal stylistics, and a stalwart dedication to celluloid filmmaking and projection. And while that emphasis is certainly present, the festival’s programmers, Mark McElhatten and Gavin Smith, deserve credit for bringing to attention the films of younger and emerging artists, works shaped by a range of available and sometimes invented technologies, and, true to the general notion of experimental film itself, films that push the size, shape, and scope of what the medium, or media, might be. Now in its fifteenth year, the mini-festival has returned larger than ever, stretching into the Monday of a long weekend and, for the first time, running simultaneous programs in two theaters, the Walter Reade auditorium and the newly constructed Elinor Bunin Munroe Film Center across the street. Claims to size, though, might be misleading; although Views is the preeminent North American festival for films of its kind, it’s still relatively small, a feature that facilitates both a manageable sense of community as well as grumbling complaints of exclusion. I’ll consider the latter an occupational hazard, particularly when the work selected is so consistently strong. The word “views” may sound antiquated, recalling the sepia-bathed landscapes of early photography, but it is also forward-looking, opening cinema up to a broader history, and inclusive future, of a variety of moving-image technologies. This year featured a gallery displaying plasma-screen installations that gestured to the always-shifting terrain where experimental film meets the art world. This intersection was perhaps best represented by Anne McGuire’s Inferno Towering The (2011), one of the video artist’s reverse edits in which an entire Hollywood disaster movie is resequenced from end to beginning. Nothing plays in reverse, so while the film might appear sensible at first, a closer look reveals severed lines of continuity. By exposing the seams of suture, McGuire demonstrates just how contingent our comprehension of film grammar can be. Additionally, as this work concerns the fall (and fallout) of a burning skyscraper, it’s difficult not to watch it without recalling the footage of 9/11, which, on its tenth anniversary, dominated television news just a month ago. The clunkiness of the original here remains, but in distorted form, and out of the work’s scrambled language emerges a long shadow of foreboding. George Kuchar explicitly invokes the Tower of Babel in Lingo of the Lost (2010), one of two collaborations the late filmmaker made with his students at the San Francisco Art Institute, the other being Empire of Evil (2011). Deliriously inventive and energetic, the two videos, like all of Kuchar’s work, gleefully transgress good taste and generic boundaries. In Lingo of the Lost, which is, fittingly, less narratively coherent than the noirish Empire of Evil, Kuchar mixes a tale of a nun who gives in to the “naked heat of poison passion” with pouty melodrama, sci-fi inflected eschatology, and a debauched Hollywood red carpet scene featuring starlets that preen and pose amid fluttering paper money. Of all the film’s wildly alliterative intertitles—see “a cosmetic cosmos of corrupt concubines” or “kidnapped by kindness”—the funniest might be “contemporary cinema,” a domain perennially ripe for Kuchar’s twisted sense of satire. Empire of Evil, meanwhile, features the lurid underworld of illicit arms dealer and nightclub owner Christina Salazar, her chaste daughter, and the detectives that get swept up in her nefarious plotting. In contrast to the tense We Can’t Go Home Again (1972/2011), the Nicholas Ray student collaboration playing elsewhere at NYFF, Kuchar’s students actually seem to be having fun. While each film contains only a few main characters, it’s the near-ubiquitous crowd of people in the background, seen draped around each other and often dancing, that lends both works a sense of irrepressible enthusiasm, an “otherworldly humanity” discovered at the end of Lingo of the Lost that could also describe Kuchar’s indelible legacy. Peter Mays similarly mixed and muddled genres with The Death of the Gorilla (1966), one of several films presented as recent restorations made by the Academy Film Archive. With the camera pointed at the television, Mays recorded snippets of Hollywood films reformatted for the small screen, with images of swashbucklers, flying saucers, and imperiled women frequently superimposed over each other and viewed through colored filters. As the title suggests, King Kong makes up the film’s core, and the recurrent images of the great ape trampling across Manhattan to his own eventual death points to, in concert with the fragments of sound and generic image crammed around it, a rush of accumulated chaos. 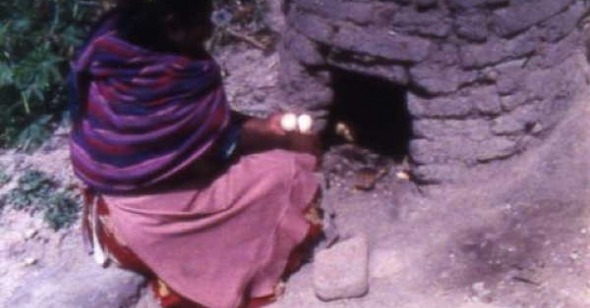 Chick Strand’s raw and vivid Señora con flores (1995/2011), another Academy Film Archives project, was easily one of the boldest works presented at Views. This tale of a flower seller and her violent husband, and the nights she’s too afraid to sleep, is set off by robust colors—seen in her wares and the brilliant prints of the clothes she washes in the river. Her words open a painful depth to the film’s images of rural splendor, though out in the fields and flowers, accompanied by her children, she finds some sense of relief. However beautiful Strand’s camerawork, the woman’s sorrowful, folk song–like story, by its very presence, insists that images cannot be read innocently as mere objects of aesthetic pleasure. Jonathan Schwartz’s Between Gold (2011) also maintains a sense of ambivalence in the viewer in its journey between the Straits of Bosporus, the waterway that connects Europe and Asia. Still shots of market vendors and mostly quiet alleyways where, at one residence, two children peer through the crack of a red door, give way to a longer sequence at sea, and there Schwartz films a woman sitting on a ferry’s open deck, her face slightly turned and her hair flapping gently in the wind. While the camera maintains its gaze on her, it’s uncertain what she’s looking at, or what she might be thinking. Her expression remains inscrutable, even when her eyes glance over to meet the camera lens, momentarily acknowledging its presence without comment. In the space between two points or two people, Between Gold stretches the unknowable distance. Such gaps are more hazily suggested in Gazette (2009), Eliénore de Montesquiou’s documentary portrait of an elderly woman, Dora Grafova, chatting about the magazines her family read during the Soviet era. Shot in soft, over-exposed Super 8, she sits at a table with a bookshelf behind her, trying to recall how many subscriptions they received. The names of the journals return to her—Peasant Woman, Worker Woman, and the curiously titled Potato and Vegetable—and she discovers she remembers more than she initially thought. Though the four-minute film appears modest in its singular question and subject, its implications are much more grand, awakening a history that many, including Grafova, have forgotten either willfully or not, and, in the process, discovering its presumed scarcities to be replete with another kind of life. A number of films depicted the process of labor, whether in the observation of factory workers or the making of moving images. Sack Barrow (2011), one of three Ben Rivers titles this year, takes place in an electroplating factory shortly before it was to be closed down. Keeping the workers on the margins of the frame, the film concentrates on the factory’s steaming vats and rusted machinery. It cuts occasionally to the decaying surfaces of doors and walls of peeling paint to emphasize an abstracted, otherworldly sense of place. We see the ritual of work, as well as the tiny, totemic objects that labor creates, but Rivers, instead of producing the kind of film that shows how things are made, remystifies the forces of production as something enigmatic, even alchemical. Daniel Eisenberg’s The Unstable Object (2011), meanwhile, fixes on the sensual aspect of work in its examination of three workplaces: a gleaming luxury car factory in Dresden; a clock-making plant in Chicago; and a small, 400-year old cymbal factory in Habiblar, Turkey. Eisenberg refrains from commentary or interview, though as Harun Farocki did in In Comparison (the two filmmakers also share a cinematographer, Ingo Kratisch), he uses juxtaposition to underscore variation in different types of work, focusing here on the progression of the senses. In Dresden, sight is emphasized through the image of routinized white-gloved labor as offered to the factory’s visitors and customers; the Chicago location showcases the sense of touch as blind and sight-impaired workers feel their way through the assembly of office clocks; and in Habiblar, where craftsmen hammer bronze discs into cymbals, sound gives the film its resplendent, hand-wrought conclusion. What’s unstable here aren’t the fabricated objects, but the way the workers are themselves variably defined by the products they make, appearing as performers, assembly line cogs, and artisans. In watching and comparing them, Eisenberg’s camera further destabilizes these roles, suggesting that a worker might be all of these things at once, and possibly more. In Klaus Wyborny’s case, the filmmaker is also a kind of engineer, and in Studies for the Decay of the West he matches tinkling piano notes and a quavering violin with 6,299 shots of industrial detritus, machine-blighted landscapes, and the facades of urban factories—from the Ruhr valley, mostly, but also East Africa, Rimini, and New York. Wyborny’s 80-minute opus, begun in 1979 and completed last year, was composed entirely in-camera based on audio recordings he made in the 1980s, and beyond the impressive magnitude of his project, his greatest achievement is his sensitivity to machine and musical decay. With filters, angled repetitions, and superimpositions designating related notes and chords, Wyborny’s synaesthetic organ also registers an acute synchronicity as sounds and images fade, together, into darkness. In many ways the opposite of Wyborny’s meticulous synthesis, selections from Stephanie Barber’s Jhana and the Rats of James Olds or 31 days/31 videos, a project she made in more or less literal residence at the Baltimore Museum of Art, also demonstrated the process of image making but in a far more improvisational way. Barber, having relocated her studio into the museum’s central gallery, worked with visitors to create a video every day, and in addition to participating in Barber’s videos, those who would normally be passive viewers of her work could also watch her shoot, edit, and exhibit their collaborative films, putting the artist and her method on display. The results are unsurprisingly aleatoric, but no less delightful. Miniatures, for example, pairs lines of text read by visitors with tiny Elizabethan portraits, and in a sense giving ghostly voice (at one point a child says, “I have already grown and died”) to the staid, stiff-collared figures. In Tatum’s Ghost she reedits an episode of Unsolved Mysteries, itself about the mildest of haunted houses, and in scrolling text overlays a range of thoughtful and absurd YouTube comments, some invented by Barber, about other people named Tatum, ghost pranks, and something called “a Hitler walk.” It’s impossible to read everything and pay attention to the clipped narrative, but the video is delightfully frustrating, providing surprises on both levels. As the eye shifts between text and image, the film demonstrates what ghostly imprints each has on the other. Charlotte Pryce’s Curious Light (2011) reads text as image, studying in close detail the shape of a book, as Pryce’s camera enters, sidelong, an illustrated copy of Lewis Carroll’s Through the Looking Glass. This manuscript is illuminated by sharp slivers of light, which also cast deep shadows in the textured page folds, suggesting mysteries as deep as the story’s rabbit hole. Laida Lertxundi’s A Lax Riddle Unit (2011) also shows a series of gentle transformations. Each of the film’s turns reveals a surprise: a woman suddenly appearing in bed, and, from behind an album cover, her shy smile. With the film’s elements of Los Angeles landscape, houseplants, and James Carr’s plaintive “Love Attack,” continually rearranged like the letters of the title, which is an anagram for Lertxundi’s own name, there is the sense of kaleidoscopic rotation, breathtaking views made with the slightest of movements: changing light, cuts, and slowly revolving camera pans. The world in Josh Gibson’s Kudzu Vine (2011), meanwhile, is already changed. Nearly buzzing with Kirilian energy in hand-processed black-and-white 35mm Cinemascope, and shot frequently in time-lapsed sequences, the film presents the title plant as though animated with otherworldly life as it overtakes the rural South. The film is a science-fiction fable in which humankind didn’t adapt; save for a cheery voice, heard from an antique radio, that extols the merits of the miracle plant, and a woman who has learned to live with the kudzu by making baskets and paper from its pulp, the landscape is entirely depopulated, and whatever life remains is covered in thick, downy layers of the omnipresent vine. Erin Espelie’s Silent Springs (2011) depicts another version of evolutionary peril. Amid a solemn, grainy wall of fountain heads, the film’s images of laboratory frogs tells a different story, their tiny figures prodded by blue-gloved fingers and tweezers, and, as the voiceover tells us, their skin dissolved by chemicals. As Silent Springs, which borrows its title from the work of biologist and conservationist Rachel Carson, highlights the deleterious effects of pesticides, it indicates how these amphibians, among the oldest forms of life on earth, are threatened by change that comes too quickly. All that may remain, the film seems to suggest, are dusty slides seen in early scenes through an antique microscope. Like the series of stony faces spouting water, their neatly labeled procession freezes an image of rarefied life. In the Q&A following the screening of Words of Mercury (2011), Jerome Hiler explained why, early in his career, he left cinema to work in stained glass. Film images were ephemeral, but with medieval glass, he observed, “the colors won’t fade.” Many years later he returned to cinema and embraced the medium’s fragility, and Words of Mercury, shot on reversal film, edited largely in camera, and projected as original, made for Views’ most immediate and most moving experience of film’s luminosity. Pairs of superimposed landscapes light up the screen, often in mixed light: an afternoon pond glowing with fireworks, a magenta seascape brushed with long stalks of yellow grass. In between these segments the film fades to a black so dense it is as if the projector lamp has been momentarily extinguished; the effect was achieved by dipping the film into black liquid. Like all of Words of Mercury’s colors, the darkness is a crucial ingredient for the film’s magic, and it matched that moment when, before a film, the theater lights are down and the audience is hushed with anticipation for what might appear. Here, too, we rested and waited for the next brilliant image to emerge. Above: Image from Señora con flores.